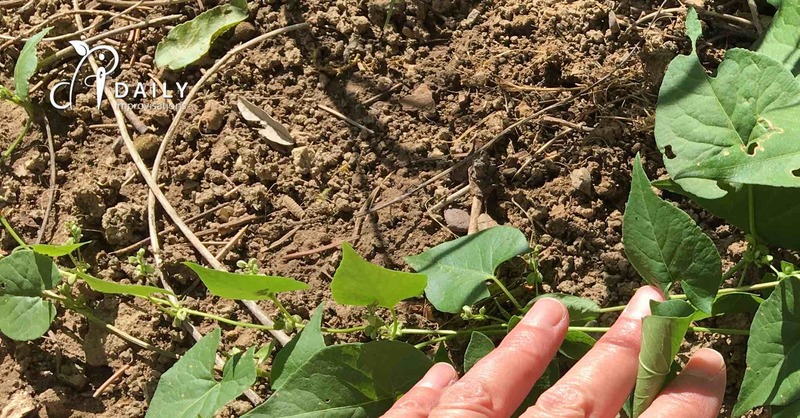 When is bindweed not bindweed? When it’s wild buckwheat! When wild buckwheat is vining up through your desirable plants, it is fairly mature and can look a lot like bindweed. However, take heart, there are some crucial differences. 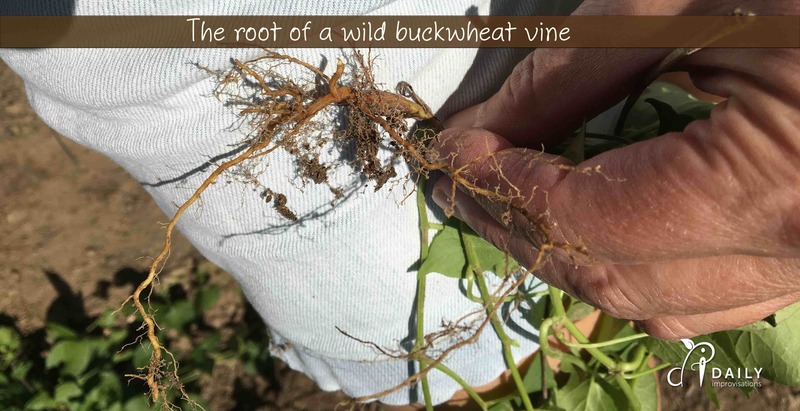 For one thing, wild buckwheat is MUCH easier to pull up by the roots than bindweed. Of course, how easily it comes up will depend some on the soil, but there is no network of roots. The wild buckwheat plants that I pulled in my yard had much more fibrous and normal root structure than bindweed. Even in a fairly dry area, the whole plant came right up. Wild buckwheat is included in the Polygonum species. This Greek name refers to the many (poly) swollen stem nodes that look like knees (gonium). If you look along where each stem grows out from the main vine, it will probably look a bit bulbous. 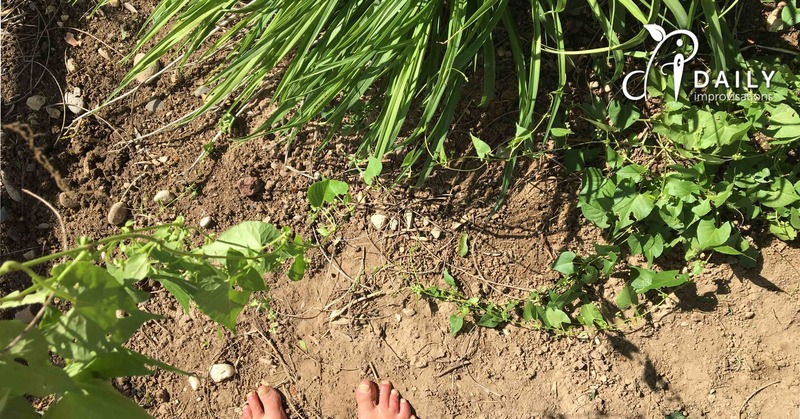 Like many weeds, it has several common names, such as climbing knotweed, black bindweed, and corn bindweed. Give me a wild buckwheat seedling any day! The wild buckwheat leaves are much more spade or arrow like than bindweed. But the easiest way to tell the difference is the flowers. Wild buckwheat flowers are barely noticeable. The one drawback to this is that they can be flowering and forming seeds quite under the radar. 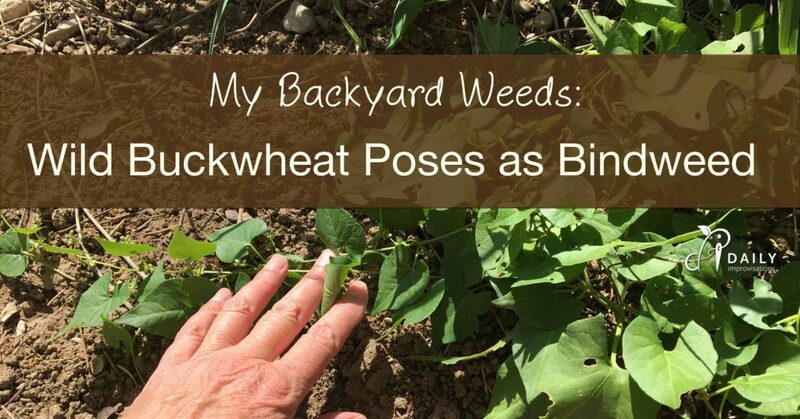 This is inconvenient, but since wild buckwheat is an annual (as opposed to the perennial bindweed), it will die in the winter. When the seeds do sprout, the first leaves are long ovals. The true spade shaped leaves appear quickly, though, making the weed pretty easy to see. AND the seedlings are super easy to pull. There are flowers in various places along this wild buckwheat vine, if you look closely. Apparently wild buckwheat is somewhat resistant to glyphosate based weed poisons. They have been from the start, so they are not some monster weed that has developed. In my experience, the best control method for them is some combination of pulling and mulching. The seedlings seem to succumb to mulch very easily. Just like with any weed, wild buckwheat can choke out other plants by using up available water and nutrients. 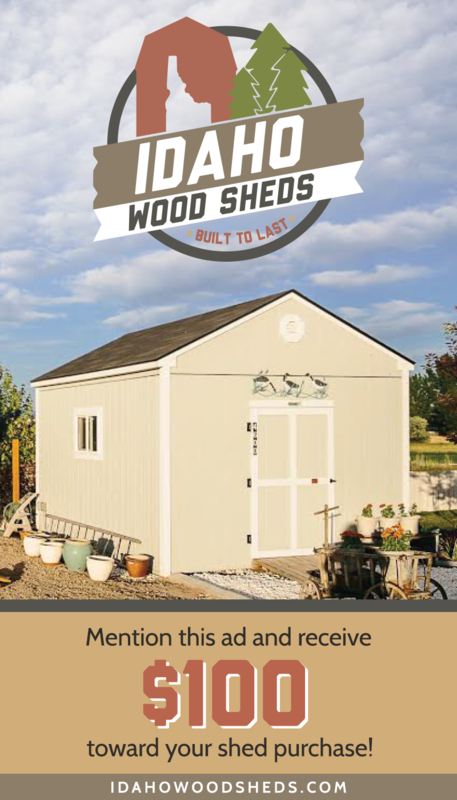 It is so light weight, it is hard to imagine it physically overpowering anything. There was one study that mentioned sugar beets having reduced sugar content if wild buckwheat was allowed to continue growing in the field. Is there anything outright good about wild buckwheat? Another way that wild buckwheat is nicely boring is that it is edible, although lacking much nutrition or taste. This means I don’t have to worry so much about it in animal pens or with small children around. I was particularly researching it because I have had this somewhat similar looking vining plant in the same area and it is known to be toxic: Bittersweet Nightshade. Some herbalists say that wild buckwheat can be used to combat sore throats or digestive issues. I couldn’t find much more information than that. This one website that I finally found that talks about ‘wild buckwheat’ and it’s herbal uses also identifies it in the same species as true buckwheat, which none of the weed identification books or websites did, so the author may be talking about a different plant all together. So there you have it. A weed with a name that sounds like it could be a rodeo bronco is about as innocuous as they come. Wild buckwheat may be boring, but sometimes that is just what a gardener needs in a weed.